Princeton Tec tiny Amp 1L packs a 45 lumen LED is designed with a large carabiner loop, this handheld light can hang off of a gear loop on your pack or the inside of your tent. The 1L comes with a snap on cone to convert your flashlight into a marker light or to provide area lighting. When the adventure is over, this light still comes in handy with its built-in bottle opener. Princeton Tec tiny Amp 1L packs a 45 lumen LED is designed with a large carabiner loop, this handheld light can hang off of a gear loop on your pack or the inside of your tent. The 1L comes with a snap on cone to convert your flashlight into a marker light or to provide area lighting. When the adventure is over, this light still comes in handy with its built-in bottle opener. 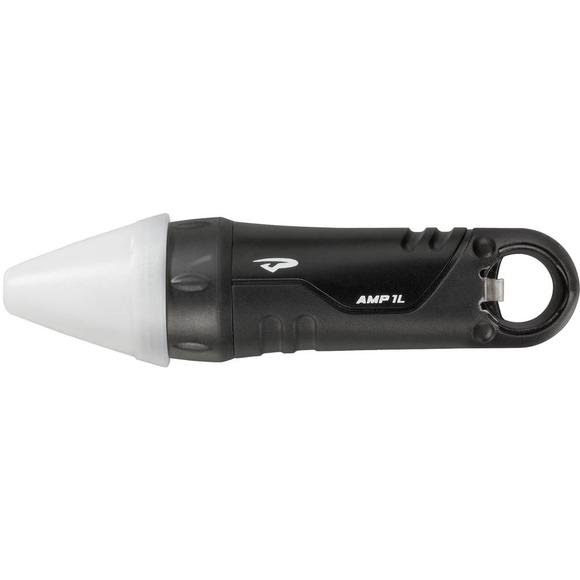 Amp 1L is waterproof to 100M (330ft). The highest of Princeton Tec&apos;s ratings, Level 3 is assigned to lights that offer a degree of water protection equivalent to IPX8 in the International Electrotechnical Commission (IEC) standards. Lights rated at Level 3 provide waterproof integrity for continual submersion in water at depths down to 100 meters.